Need help writing your dental assistant resume? Below you’ll find your free downloadable sample, matching cover letter, and 4 writing tips to get you started. 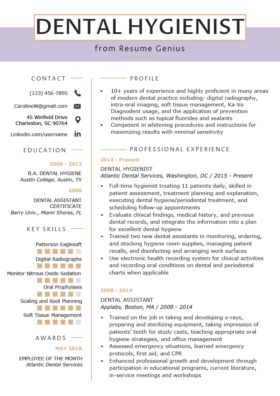 The resume example above was written for a person with 4+ years of experience as a dental assistant. You may have more or less experience than this specific person – and at is fine. In this guide, we will teach you how to write an effective dental assistant resume, whether you are just coming out of school or have years of experience. A dental assistant entertains a little girl at the clinic. A hiring manager at dental clinic is going to be most interested in your dental assistant license or certification. It’s true that in some states, a certification is not necessary to get hired, and you can even be trained on the job. However, if you do possess a certification, including it at the top of your resume is the best way to ensure the hiring manager knows that you have the proven skills and knowledge to perform dental assistant duties. In this resume, the DANB Certified Dental Assistant certification is placed in its own section at the top, and is also mentioned in the Career Objective. In most cases, the hiring manager will read your resume from top to bottom. For this reason, it’s important to give your resume a strong introductory statement, which we call a Career Objective. There are other ways to start your resume, depending on your level of experience — you can check out our flow chart here. Dental Assistant with 4+ years of experience1 providing efficient and competent service2 in busy dental clinics. Able to handle all necessary assistant duties without supervision3. Possess a 2015 DANB certification4 and a Dental Assistant Associate Degree. Provide superb customer service, ensuring patient retention and loyalty for your clinic5. Remember, a resume is essentially a sales document selling yourself. Always finish your Career Objective by stating how you can help the clinic achieve its goals. If you don’t have work experience yet, sell yourself by mentioning relevant coursework and earned degree(s). Remember, a resume is essentially a sales document selling yourself. To write the best Professional Experience section, you must capture your full range of experiences, abilities, and most importantly, achievements. “Scope and breadth” is one way to include numbers on your resume that reflect your competence. The ability to handle 15 patients a day immediately reveals to the hiring manager that this candidate can clearly handle the routine of setting patients up, cleaning tools, preparing materials, and all other aspects of running a dental clinic. Everyone values accuracy and competence, no matter what job you are applying for. The number one worry that hiring managers have is that the candidate they are hiring is careless and needs constant supervision. Help relieve those fears by talking up your competence. In this case, getting patient records and histories right 100% of the time saves everyone a big headache in a dental clinic. If you helped your clinic (or workplace) save money in some regard, include it on your resume. This kind of achievement makes your competence, intelligence, and value immediately apparent. The dental profession requires knowledge of and ability to use tools. Your Additional Skills section should reflect your specialized knowledge, especially if you were unable to fit it into the professional experience section. Don’t worry, you can even repeat tools in your Additional Skills section – this will make your resume better optimized for Applicant Tracking Systems, and increase the chances that your resume will get past the system and into the hands of a human. This applicant included general tools and software such as MS Office. Believe it or not, the applicant also included that he/she has a professional bedside manner. As a dental assistant, your bedside manner could be the difference between a patient hating the experience and never coming back, or recommending your services to friends and family. We wish you the best of luck with finding employment.